Waterford Fine Bine China, One Saucer, and One Bread or Dessert Plate, in the "Kell's" Pattern #WFCKEL, Circa 1997-2003. Two Pieces of this Beautiful 22kt Gold Encrusted Bone China in the "Kell's" Pattern #WFCKEL. 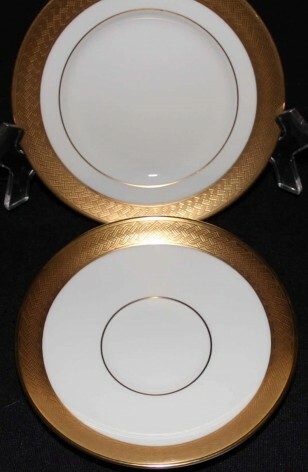 Both the Saucer, and the Bread or Dessert Plate, have Borders which are entwined with 22kt Gold Ropes, in a Herring Bone Design.. and each have a 22kt Gold Stripe; also 22kt Gold Verges on the Plates.. Would be a great addition, or replacement to any Kell's China Set. But would also make a Statement with any Cup that has 22kt Gold in the Pattern.. Great Condition. Two Pieces of this Beautiful 22kt Gold Encrusted Bone China in the "Kell's" Pattern #WFCKEL. Both the Saucer, and the Bread or Dessert Plate, have Borders which are entwined with 22kt Gold Ropes, in a Herring Bone Design.. and each have a 22kt Gold Stripe; also 22kt Gold Verges on the Plates.. Would be a great addition, or replacement to any Kell's China Set. But would also make a Statement with any Cup that has 22kt Gold in the Pattern.. Very Good Resale Condition unless noted below or in pictures.